I decided the other day that not only do I want to use this space to share recipes, but also as a place to review or introduce new products that I’ve discovered while browsing the supermarket aisles. I love tea. As the days get shorter and a little chillier, I find myself reaching for a hot cup more often. I gravitate towards chamomile, mint (after a heavy meal), green, chai, red rooibos and many others. 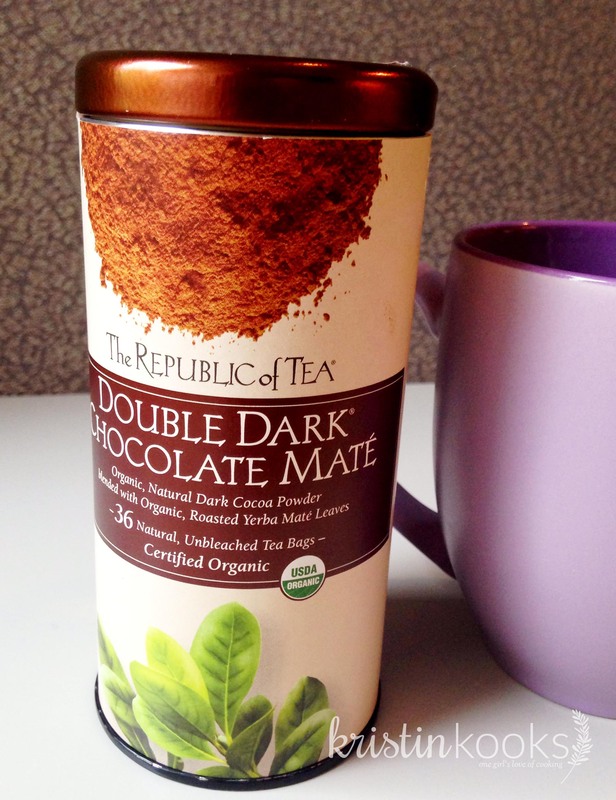 Today I stumbled upon Double Dark Chocolate Maté by The Republic of Tea. What caught my eye was the word chocolate! No surprise there! Not only do I enjoy a steaming cup of tea, but I’m a fan of hot chocolate as well. The thought of mixing the two? Win! Yerba Maté is a South American plant grown in Brazil, Paraguay and Argentina. When blanched and dried over wood smoke it imparts distinctive roasted notes to the tea. Consumed by millions of South Americans it is seen as a healthy alternative to coffee. This tea is a blend of Yerba Maté and organic dark cocoa powder. Don’t be surprised when you first open the tin if a faint whispy cloud of powder seeps out. It smells delicious! I drank this in a large mug, filled with hot steaming water and some almond milk with honey. I really enjoyed the taste of it. Often when I’ve tried chocolate teas, the chocolate flavor isn’t too strong. This one was rich and smooth tasting. Now, please note, this is not going to taste like straight up hot chocolate. It is a tea. But, the flavor combination is really nice. The next time you are roaming the tea aisles, pick one up and try it out. Happy drinking! Now that sounds like something I want to try. Where did you find this? Hi Scott! I actually found it at the local Co-Op market near my work, but Whole Foods or even Amazon (see link below) are possibilitiets. It’s not cheap, but it’s tasty!